Andaz London Liverpool Street (www.hyatt.com/en-US/hotel/united-kingdom/andaz-london-liverpool-street/longe) is a five-star lifestyle hotel that offers a vibrant experience truly unique to each guest: blending personal preferences with attentive and uncomplicated service. Part of the Hyatt portfolio, the hotel is global in scale while local in perspective. Immersed in the ever-changing, creative culture of its native East London surroundings, every guest feels like a local from the moment they begin their journey at the Andaz London Liverpool Street. The interiors blur the lines of traditional hotel spaces in order to open barriers between staff and guests, and allow a sense of discovery and delight. Whimsical and clever use of design throughout the hotel promotes discovery and sparks interaction, inspiring guests to think differently. The Andaz London Liverpool Street has removed stress-inducing barriers like the traditional front desk and queues, and instead efficient hand-held devices make the entire check-in process seamless. The Andaz Lounge replaces the traditional hotel lobby: a creative gathering space for guests and locals to be inspired, make connections and share ideas. Design elements feature a ‘Wall of Mirrors’ with ever-changing art and design installations to evoke the hotel’s locale. Complimentary beverages and snacks are offered in the Andaz Lounge throughout the day creating a relaxed, residential feel and providing a social focal point for guests to gather. The hotel has 267 spacious and modern guest rooms including 15 suites. Designed in a residential style, the rooms embody the comfortable and welcoming ethos of the Andaz ‘home’, with winged-backed chairs by Morgan, bespoke bijou walnut desks and super plush beds. Large photographer’s lamps by Artisan reinforces the theme of playfulness and creates a warm atmosphere. This latest design captures the hotel’s history and heritage and reflects the hotel’s unique location as the gateway point between the traditionally refined City and the dramatically changing and vibrantly creative Shoreditch. Its aesthetic is shaped by the unique identities of both these different areas. The hotel offers four Room With A View guest rooms, each featuring an entirely unique design by a London street artist for guests to experience, in a space like no other in London. As part of the ‘home’ experience guests have access to complimentary Wi-Fi, soft drinks, juices, water, snacks and unlimited local landline phone calls. Andaz London Liverpool Street operates five restaurants and bars, each with their own distinctive character and unique offering. Rake’s, a place to escape the city, is a café by day and bar by night, offering simple and comforting food alongside fantastic coffee and a specially crafted cocktail menu of modern and classic concoctions. Guests can snack, eat and drink throughout the day and will be hosted by a team of individual characters, all with a love of wine, food and cocktails – There is no formality, no rules. 1901 Wine Lounge features an eclectic and adventurous selection of wines available by the glass and bottle from a host of established vineyards and lesser known producers. Designed for both connoisseurs and casual drinkers, the Lounge has an impressive list of over 160 wines and is focussed on making excellent vintages accessible to all, with an intrepid selection of 18 wines available by the glass. Evoking the feel of the east end, Eastway Brasserie offers a relaxed yet vibrant dining experience throughout the day with terraced seating on the buzzing East London streets. The restaurant serves a breakfast menu featuring a range of brunch classics alongside more innovative dishes. Miyako is an intimate and authentic Japanese restaurant offering diners a traditional menu of sushi, sashimi and teriyaki alongside a range of sake and Japanese beers. Lady Abercorn’s is a contemporary public house full of intrigue, serving both classic and innovative gastronomy, a large selection of wine, spirits and beers – including the Lady A IPA, that it brews itself – and promises to be a destination for the curious, with live performances and delights and discoveries to be made by those who know how to ask. An on-site Health Club, Steam Room and In-Room Spa facilities offer guests the opportunity to relax and recharge in the City. The Health Club provides a tranquil retreat for guests to work-out with state-of-the-art fitness machines and individually fitted TV screens. One to one personal training sessions may be booked, and for those guests preferring to exercise outdoors, the Health Club team can provide walking and jogging routes within the local area. Located in the heart of the City and the creative Shoreditch scene, Andaz London Liverpool Street is ideally located for all types of events, from small business meetings and conferences to weddings, dinners and dances. Fifteen modern and distinctly unique spaces are offered to accommodate any occasion, for up to 500 guests, from the informal and contemporary loft-style Andaz Studio with floor to ceiling windows to the majestic scale and grandeur of the 1901 ballroom. Crowning the centre of the 1901 ballroom is the building’s original stain glass dome, which survived the Blitz of the 1940s and provides the space with a captivating feature. 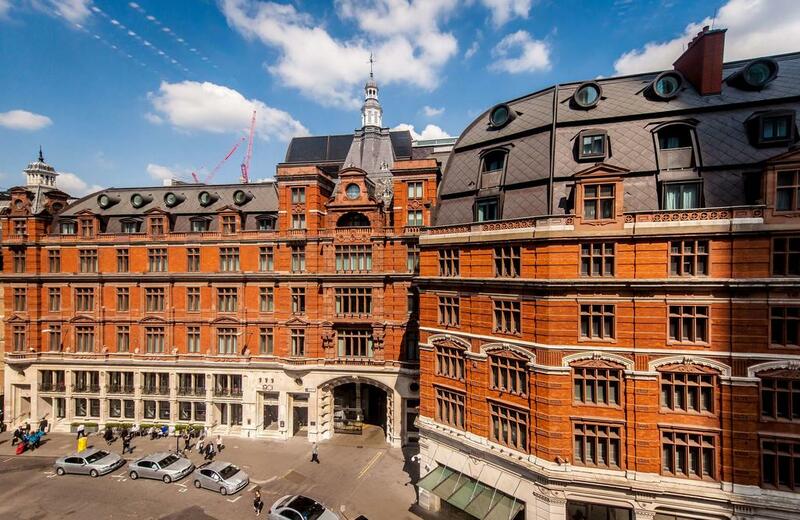 Located on the first floor, the Exchange seamlessly blends modern with traditional, featuring high ceilings and large bay windows with a traditional Victorian fireplace and contemporary furnishings. A stunning oak table fills the centre of the room with space for up to 16 seated guests. Perhaps one of London’s best kept secrets is The Masonic Temple housed in the depths of the hotel and available for private hire. Concealed by heavy, studded doors and accessed via a winding staircase and a spacious mahogany-panelled anteroom, this is the City’s only original Freemason’s meeting lodge and was built in 1912. Opulently furnished in twelve varieties of Grade II listed Italian marble, with Doric and Ionic columns, gilt fittings and a splendid zodiac ceiling, the temple was rediscovered only by chance during the hotel’s refurbishment. Complimentary internet, on-site audio-visual and production services and an experienced and dedicated team are provided for all events. All of the five mains bars and restaurants are also available for private hire and corporate events.